Today we wrap up our little tour of the Thermenregion of Austria by taking a look at the Zierfandler grape. A few days ago, we took a brief look at this grape in its blended form from the village of Gumpoldskirchen, while yesterday we took a look at its frequent companion and blending partner, Rotgipfler. Unlike Rotgipfler, Zierfandler's parentage is not 100% certain. It was long thought that Zierfandler's parents were the same as Rotgipfler's (namely a cross between Roter Veltliner and Traminer), but that doesn't seem to be the case, and in fact, neither of Zierfandler's parents have been identified to date. The most common alternate name for Zierfandler is Spätrot, which means "late-red" due to the tendency of the grape skins to take on a reddish tinge the longer they hang on the vine. When Zierfandler is blended with Rotgipfler, as it often is, the blend is usually given the name Spätrot-Rotgipfler, for reasons that should be pretty self-evident. Zierfandler is considered to be the nobler of the two grapes by the critics who are paid to make those kinds of pronouncements, so you can take it with the same grain of salt that you reserve for any broad, sweeping generalizations that involve something as particular as taste. Zierfandler ripens very late, later even than Rotgipfler, which can be either a good thing or a bad thing. In cooler years, the grapes may not reach full ripeness, but in special years, botrytis (the good kind) may have a chance to set in (the grape is fairly thin-skinned to boot). Since it tends to retain a good deal of its acidity throughout its growing cycle, it can make very interesting wines from nobly rotten or late-harvested grapes. 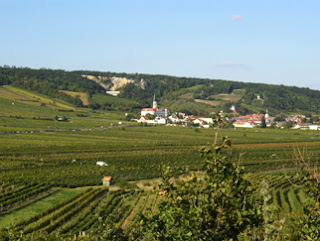 There are purportedly less than 100 ha of land devoted to the vine in the Thermenregion of Austria and only scant plantings in other European countries like Hungary (where it is known as Cirfandli) and Slovenia (where it is known as Zerjavina), so I would imagine that late-harvest and botrytis-affected wines are very rare and hard to come by (with commensurate price-tags, I'm sure). There's an interesting theory out there that Zierfandler may have inadvertently been the source of the US name for the grape Zinfandel, though the two grapes are completely unrelated. The story goes that George Gibbs brought shipload of vines into the US in the 1820's and he called some of the vines in that shipment "Black Zinfardel of Hungary." Now, there is no grape that goes by the name of Black Zinfardel of Hungary, so it's tough to know exactly what he was talking about, but we do know that the shipment came from the Austrian imperial Nursery in Vienna, located about 30 miles north of the Thermenregion, where Zierfandler finds its home. The imperial nursery was also known at the time to have cuttings of a grape known as Crljenak Kaštelanski, which is the old Croatian name for the grape currently known as Zinfandel. What is thought to have happened is that the Zinfandel vines were sent over and the label for Zierfandler vines somehow ended up on them. It's certainly possible that the Zierfandler we're talking about here today was the culprit in this case of mistaken identity, but it doesn't seem likely. Miles Lambert-Gocs has a theory that the Zinfandel name actually came from some of the alternate names for Blaufränkish. Blaufränkish is one of those grapes that is cultivated in a wide variety of regions and thus has a lot of synonyms (83 are listed in the VIVC database). David Darlington, in his Zin: The History and Mystery of Zinfandel, quotes a Lambert-Gocs article (which Lambert-Gocs has summarized to some extent here) where he states that one of Blaufränkish's known synonyms in the 1800's was Blauer Zierfahndler and, further, it is still known as Cierny Zierfandler in Slovakia. It is much more likely that what happened was that some Blaufränkish was being sent to the US and either the labels got switched in transit or the vines were misidentified after they got here. It may be possible that these synonyms for Blaufränkish were derived from our Zierfandler, keeping the etymological chain alive, but it's unlikely, considering that Zierfahndler (and Zierfandler) is also a synonym for the Silvaner grape, which is much more widespread and which has been around since at least 1659, meaning that there's a better chance that the name Zierfandler is derived from Silvaner than the other way around. Anyway, we're here to talk about Zierfandler, not Zinfandel, so let's get back on track. As mentioned above, Zierfandler isn't widely grown by any stretch of the imagination, but one of the estates that does deal with it is Weingut Stadlmann. The Stadlmann estate has been in the wine game since its foundation in 1780 by Johann Stadlmann. The estate and the winemaking responsibilities have been maintained and passed down through seven generations. 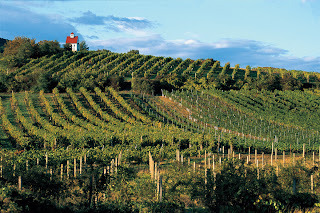 As of 2007, the estate has been biodynamically certified by Lacon in Austria. 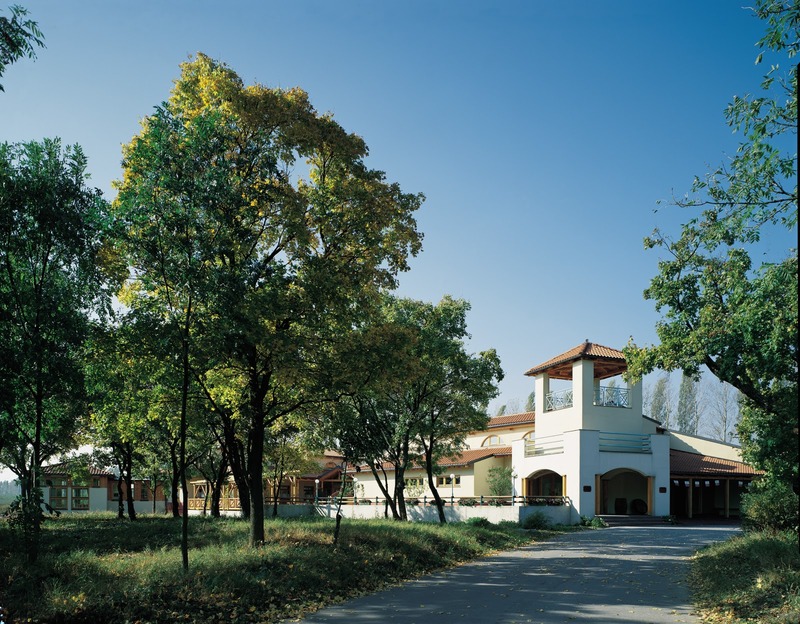 They produce a few single-vineyard bottlings from their Mandel-Höh, Tagelsteiner and Höfen sites, which are home to 45 year old vines, as well as their Igeln site, which is houses 20 year old vines. Overall, they have about 13 hectares of land under vine. I was kindly sent a sample of their 2010 Anninger bottling, which is their entry level Zierfandler, by Monika Caha Selections. They tell me this wine retails for about $16 and is currently available in CA, NY and NJ, though they hope to have distribution in about 20 more states by next year. In the glass, the wine had a medium lemon gold color. The nose was very reserved here with some lemon citrus and apple flavors, but not much. It didn't really open up much as it came to room temperature or with a day open in the fridge, which apparently isn't all that unusual for this grape. On the palate, the wine was just on the fuller side of medium with fairly high acid. It was dry with flavors of apple, lemon-lime citrus, ripe grapefruit, and honeysuckle flowers with a bit of a bitter, lemon peel kind of finish. The wine also had a nice, refreshing kind of minerality to it. The wine is aged for four months on the lees, so there was a broad, almost creamy flavor profile here that was nicely undercut by the bright fruit flavors and zippy acidity. If you served a nice Austrian Riesling with a twist of lemon in it, you probably wouldn't be too far off from the flavor profile here. Yesterday we took a look at a wine from Austria called Gumpoldskirchen that is made from Rotgipfler and Zierfandler grapes. Today and tomorrow we're going to take a closer look at each of those grapes, starting with Rotgipfler today. Rotgipfler is a white wine grape that is thought to be indigenous to the Thermenregion of Austria (located in the eastern part of the country, just south of Vienna), though Philipp Blom, in his The Wines of Austria, indicates that it may actually be from Styria originally, just south of Thermenregion. 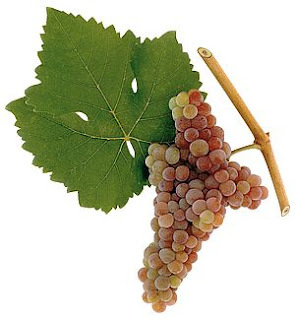 Its parentage has been confirmed as a spontaneous crossing between Traminer (aka Savagnin) and Roter Veltliner (Sefc, K.M., Steinkellner, H., Glossl, J., Kampfer, S., Regner, F. (1998). Reconstruction of a grapevine pedigree by microsatellite analysis. Theoretical and Applied Genetics. (97) 227-231). The Roter Veltliner link may lead you to believe that this grape is also related to the Austrian specialty Grüner Veltliner, which is sometimes known by the name Weissgipfler, but it turns out that that's probably not true (there has been no proven link between Roter Veltliner and Grüner Veltliner). The name Rotgipfler has something to do with redness somewhere on the vine (rot being the German word for red), though different sources seem to disagree about precisely where this redness is occurring. Some say that it is the tips of the leaves that are red, some say it is the shoots that are red, while the winery's fact sheet seems to give a literal translation of "red shoot-apex," whatever that means. Something on the vine that is not the grapes is red, that much we know for sure, and that's where the grape's name comes from. It is considered something of an also-ran in the Thermenregion by outside observers, with nearly every critical source starting out their evaluation of the grape by unfavorably comparing it to its running-mate, Zierfandler. Jancis Robinson (in The Oxford Companion to Wine) describes it as "the marginally less noble of the two," while Blom is less equivocal in his statement that it "is certainly the less noble of the two." Robinson offers no support for her declaration of the grape's inferiority, while Blom's reasons seem to be linked more to the fact that the grape is fairly difficult in the vineyard. He points to the grape's habit of ripening late (though it still ripens earlier than Zierfandler, a fact passed over in silence by Blom), its fussiness in terms of its soil and climate preferences, and its sensitivity to wind-chill and botrytis before concluding: "it can produce some full-bodied wines with marked acidity, golden colour, and characteristic aromas of clementines and almonds. Often, though, it produces light and fresh wines that are not remarkable in terms of sophistication and complexity." Whatever the critics believe, the vine is planted on pretty much the same amount of land as Zierfandler in the Thermenregion (just over 100 hectares), and the local winemakers seem to think that it's good enough to stand on its own. Johanneshof Reinisch is one of those local producers. They are a family owned estate that has been producing wine in this region for four generations, starting with a meager half hectare in 1923 that grew to the over 40 ha spread (broken up over several regions) that they farm today. The majority of their plantings are red wine grapes, with about 65% of their vineyard area dedicated to red grapes (especially Pinot Noir and St. Laurent) and the remaining 35% to white. A brand new winemaking facility was built in 1995 and the winery continues to walk the line between tradition (large neutral oak barrels and natural fermentation) and modernism (temperature controlled stainless steel and high-tech mechanical sorting and pressing equipment). I was sent a sample bottle of the 2010 Johanneshof Reinisch Rotgipfler by the good people at Circo Vino. They tell me this bottle retails for about $20 and is available in the NY, NJ, IL, CA, FL, OR, and WA markets with the possibility of Massachusetts distribution in the near future. Some batches of this wine undergo spontaneous wild yeast fermentation, but all batches are kept on their lees for about four months after fermentation stops and the batches are blended together and bottled. In the glass, this wine was a pale silvery lemon color with greenish tints. The nose was nicely aromatic with lemony citrus, ripe pear, green apple and white flowers. The wine's body was on the lighter side of medium with medium acidity. There was nice lemony and light apple fruit and a very clean, very refreshing minerality that kept me reaching for the glass. This wine made me long for the warmer days of summer (which I don't often do) and had me wistfully looking out my window at the gloomy Boston October I found myself in. Fans of lighter Italian Pinot Grigio will find a lot to like here. I kept imagining myself eating raw oysters on the half-shell with just a twist of lemon on them while I was drinking this. It's not the most complex wine you'll ever drink, but it's incredibly refreshing and there's always a spot in my cellar for wines like that. Today's post is a first for Fringe Wine. The bottle that I will be looking at today was kindly provided as a sample by Circo Vino, an importer located in Evanston, Illinois, and is the first free sample that I've ever been sent. They sent two bottles my way, this one and a varietal Rotgipfler which I will be examining tomorrow. I know there's a lot of hullabaloo surrounding wine writers/critics/bloggers and the acknowledgement of free stuff, so I just want to put it right here up top. This bottle was a free sample. That said, I plan to evaluate it exactly the same way as if I paid retail price for it. The title of today's post, Gumpoldskirchen, doesn't refer to a grape name, but rather to a place. That place is the village of Gumpoldskirchen, located in the Thermenregion of eastern Austria (so named for the many spas or thermen found here), about 20 miles south of Vienna. This region's climate is marked by hot summers, cold winters, and moderate rainfall. The soils are littered with ancient marine fossils and, in general, are marked by heavy loam, gravel and clay. This village was one of the shining stars of Austria and was at the forefront of quality production in the 18th and 19th Centuries. Even into the early 20th Century, the wine from here was so well thought of that it was served at the wedding of Princess Elizabeth and Prince Philip in 1947 and, further, was served at a 1961 summit meeting in Vienna between president John F. Kennedy and Soviet Premier Nikita Krushchev. The wines made within the Gumpoldskirchen district were known as Gumpoldskirchen Königswein, or the King's wine, a reflection of their reputation and lofty status. And then disaster struck. In 1985, a few wineries in Austria were caught adding diethylene glycol, one of the main ingredients in antifreeze, to their wines in order to boost their body and sweetness. The Austrian classification system is very similar to Germany's and is based on the sugar content of the grape must prior to fermentation. It was (and is) illegal to add any sugar to the fermenting must in order to boost your wine into a higher classification tier. The problem that the Austrian producers had was that many of them had contracts that specified that they had to provide a certain amount of wine from each tier to their buyers and when a series of cool vintages struck in the early 1980's, the grapes weren't able to ripen fully and the producers were stuck with an excess of wine at the lower tiers and a dearth of wine at the higher ones. Simply adding sugar would have raised the overall sweetness level of the wine (illegally), but the body of the finished wine would be thinner and it would be more apparent than some doctoring had taken place. Diethylene glycol tastes sweet and is viscous, meaning that if it were added to the must, the wine would taste sweeter and have the unctuous texture that consumers would expect to find in wines in those quality tiers. Diethylene glycol also happens to be toxic and when the adulteration was discovered and brought to light in 1985, it ignited a huge scandal that had a devastating effect on the Austrian wine industry. Exports dropped 90% virtually overnight and did not reach their pre-1985 levels until 2001. The village of Gumpoldskirchen was not directly implicated in the scandal, but the tarring brush was wide and the wine industry across all of Austria suffered greatly and equally for the transgressions of a very few. It has recovered, as has the rest of the Austrian wine industry, over the past few years, though it would be difficult to say that the current fame of Gumpoldskirchen in particular matches its illustrious past. Gottfried Schellmann made wines in the Gumpoldskirchen region for over forty years, long enough to experience both the zenith and nadir of Austria's vinous reputation. He owned nine hectares of vineyard land scattered throughout the Gumpoldskirchen region and was a driving force in attempting to elevate the reputation of these wines to their former glory. He is quoted as saying "the pinnacle has not yet been reached in the Thermenregion," and one can imagine that the statement is not tied to any particular time, but is rather intended as a motto for ever striving to greater things. And then there's Fred Loimer, a well-regarded grower and winemaker from the Kamptal region of Austria. Fred ventured into the Thermenregion in 2002 looking for new challenges and new opportunities in the different climate and with the different indigenous grapes that the Thermenregion offers. Fred and Gottfried partnered up in 2002 and when Gottfried passed away in 2005, Fred stepped into an ownership role with the Schellmann properties and has continued to make wines from their estate fruit. All of the vineyards in the Gumpoldsregion that are bottled under the Schellmann label are biodynamically farmed and Fred is one of the founding members of the "Respect" association of biodynamic farmers in the region. There are several different wines in the Schellmann portfolio, but perhaps the most interesting is the basic Gumpoldskirchen cuveé. The wine is based on the Michsatz, a traditional field blend from the region that consists of Rotgipfler, Zierfandler, Muskateller, Traminer (our old friend Savagnin), and Riesling. In the next few days, I'll be posting more about Rotgipfler and Zierfandler as I was also generously given varietal bottlings of these two grapes. Muskateller is the Austrian word for the local member of the Muscat family of grapes, and it will also likely get its own mention here before too long. The bulk of the Gumpoldskirchen cuveé is made up of Rotgipfler and Zierfandler, a classic blend in the Thermenregion that is called Spätrot Rotgipfler when they are the only two grapes used. According to the winery's fact sheet (in German, as the English version contains a typo here), this bottling has a touch of Muskateller and Traminer, but no Riesling in it. The grapes are crushed and left to macerate with the skins for a short period of time before being pressed. Fermentation takes place in both stainless steel and large, neutral oak barrels, where the wines are matured for a further eight months after fermentation ends. The wine I was offered was the 2008 Gumpoldskirchen cuveé, which I am told retails for about $25. The wine is not currently available in Massachusetts, but should be by the end of the year. It is available in NY, NJ, IL, CA, FL, OR, and WA. In the glass, the wine was a medium lemon color. The nose was nicely aromatic with juicy pear, ripe grapefruit, honeysuckle flower and a distinct Muscat-like peachy, flowery smell. I am a sucker for intensely aromatic white wines and this was pushing all the right buttons for me. On the palate, the wine was medium bodied with fairly high acidity. There were racy grapefruit and orange citrus flavors with honeysuckle flowers and a bitter, pithy finish. There was a distinctive chalky kind of minerality to the wine that I don't always find welcome (hello there Chasselas), but here, the primary fruit flavors were well defined enough that the chalkiness wasn't to the wine's detriment (whether it's to the wine's benefit is a more personal question that you should probably answer for yourself). As the wine warmed and opened up, nectarine stonefruit started to become more apparent and the Muscat-like character calmed down a bit. The wine gives the sense of being perhaps a bit off-dry, but the residual sugar content is purportedly only 2.9 g/l, so it's probably just the ripe fruit flavors here that are contributing to the illusion. Overall, this was a very enjoyable wine that is definitely suited for fans of interesting, complex, aromatic whites like Muscat or Riesling. Today's grape finds us once again on the island paradise of Santorini in Greece. 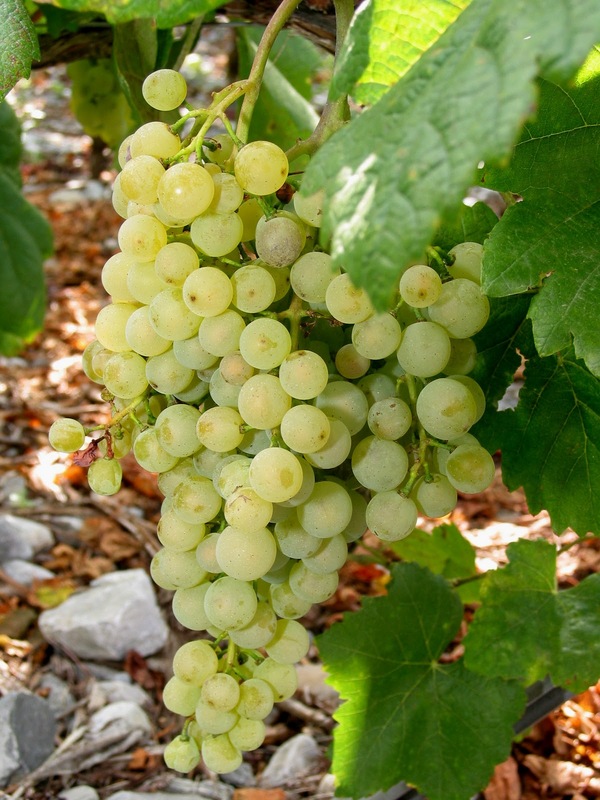 Last time we visited, we took a look at a few white grapes (notably Assyrtiko) made in a variety of styles. Today we'll look at the most planted red grape on the island (accounting for about 20% of the total vineyard area), Mandilaria. We'll also make a quick stop on the island of Crete to take a look at a rosé wine made from Mandilaria and Kotsifali. Mandilaria is one of those grapes that's very popular with growers, but not necessarily with critics. From a grape grower's perspective, the vine is great because it yields easily and productively. It does need care in the vineyard as the canopy can get out of control in a hurry, so careful and frequent pruning is necessary as is wide spacing between the vines to avoid overlapping canopies. 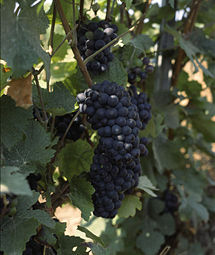 The vine is susceptible to rot and various fungal diseases, but is resistant to hot, dry conditions (purportedly as a result of its Cretan heritage). If you've read the Assyrtiko post above, you may be thinking to yourself that the conditions that this grape seems to need for its greatest success are the very same conditions that you find on the arid, windy island of Santorini, and you'd be absolutely correct. As mentioned in that post, Santorini is technically a desert, so not only are the dry conditions on the island not a problem, the moisture related maladies that Mandilaria is afflicted by aren't an issue either. Because of the very dry conditions, vines have to be planted very apart so that they don't compete with one another too much for the meager water supply so the canopy overlap problem is thus solved as well. Mandilaria generally finds itself in red wine blends thanks to its ability to produce deep, intensely colored wines. In quantities as low as 10%, Mandilaria is known to deepen the color of wines made from grapes that traditionally don't need much help in the color department like Cabernet Sauvignon. There are few varietal bottlings of Mandilaria available because, as Konstantinos Lazarakis puts it in his Wines of Greece, "intense color sums up most of its character." That may be true in areas like Crete, but the conditions of Santorini are very special so I was eager to try two different Mandilaria bottlings from Santorini. The first wine I tried was the 2007 Argyros "Atlantis" bottling which I picked up for about $20 from Federal Wine and Spirits. The wine is a blend of 90% Mandilaria and 10% Mavrotragano, a very rare specialty of Santorini. In the glass, the wine was fairly deeply colored with a purple-ruby hue. The nose was fairly aromatic with blackberry, black cherry, cola and mushroom aromas. On the palate the wine was medium bodied with fairly high to high acidity and solid, grippy tannins. There were flavors of black cherry, sour cherry, tart blackberry, cola and an earthy, raw mushroom kind of flavor. Right out of the bottle, the wine was very tart but as it opened up, the ripe black fruits started to spread out a bit and the tannins got nice and silky. It reminded me a lot of a fruity Zinfandel minus the brambly, peppery fruit. The second wine has me a little confused at the moment. It is also from the Argyros winery and purports to be 90% Mandilaria and 10% Mavrotragano, but the proprietary name on the bottle is "Aspa," and there's no reference to a bottling series under that name on the Argyros website. I'm guessing that they changed the name of that particular line at some points between 2005 (this bottle's vintage) and 2007 (the Atlantis bottle's vintage). In any case, I dug this wine up locally for about $15. In the glass the wine was a deep purple ruby with a bright lavender rim. The nose was fairly aromatic with the same ripe black cherry and blackberry fruit and cola notes, but there was a smokiness here and there was a bit of dried cherry fruit and cocoa aromas. On the palate, the wine was medium bodied with fairly high acidity and medium silky tannins. There were flavors of ripe black cherry, dried chery, blackberry fruit and cola. The flavors were very intense and concentrated and really made me think about dried cherries soaked over night in Coca-Cola. Both wines were very ripe and densely flavored, if not extraordinarily complex, and would probably appeal most to fans of California Zinfandel or Australian Shiraz. Today's bonus wine is a rosé that I picked up made from Kotsifali and Mandilaria grapes. Kotsifali is Mandilaria's nearly constant running mate in wines made on the island of Crete since their strengths and weaknesses line up nearly across the board. Mandilaria makes intensely colored wines with good tannic and acidic structure, but Kotsifali has pale, thin skins that are difficult to get decent extraction from and suffers from low acidity. Mandilaria has a fairly simple, fruity aroma and flavor profile while Kotsifali has a spicy, flowery, herbaceous quality to it that accents the primary fruit of Mandilaria. Mandilaria is fortunate to reach 12.5% alcohol under ideal conditions while Kotsifali easily surpasses this number (whether that's a good thing or not is really up to you, I suppose). Together, the two grapes can make quite a dynamic duo. The only wine I've been able to find from these two grapes was a rosé from the Creta Olympias winery (who also made the Vilana that I reviewed here a few months back). The bottle I found was from the 2007 vintage and it cost me about $10. I was a little concerned upon purchase that this was a four year old rosé from a producer I'd not had great success with, but the color looked good and I figured it was worth a shot for $10. In the glass, the wine was a medium salmon pink when I had a small pour for tasting purposes, though it had more of a bright, cherry red color in the bottle and in a full glass. The nose was nicely aromatic with sour cherry, strawberry and tart red berry fruits with just a touch of funk hanging around. On the palate the wine was medium bodied with fairly high acidity. There were lively flavors of strawberry, raspberry and maraschino cherry fruit that faded quickly from the palate and left a kind of funky aftertaste behind. If I was drinking this with a funky cheese, the aftertaste may have been welcome, but on its own, it was a bit off-putting. Age could have certainly been a factor here, and I would like to try this in a newer vintage, but my experience with this bottle would have me direct others to any of the wealth of value-priced rosé wines out there these days. Petit Verdot is one of those grapes that probably every (somewhat serious) wine drinker has had at some point, though until recently, it was probably only in a blend. In its best known incarnation, Petit Verdot is one of the "classic" varieties planted in the Bordeaux region of France. It has never been a majority player in Bordeaux, but it is popular with wine makers there for its ability to add color, structure and aroma to the classic Bordeaux blend. 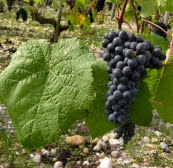 The major problem with Petit Verdot in Bordeaux vineyards was that it ripens very late, even later than Cabernet Sauvignon, so the grapes only reached full ripeness in the warmest years (its name means "little green" because of the fact that under improper ripening conditions, the grapes never undergo veraison and remain as unusable small green berries). As a result of this, many estates pulled out their Petit Verdot vines in the 1960's and 70's, reducing the total vineyard area of the grape to less than 300 ha by the 1980's. As vintages have gotten progressively warmer through the 90's and 2000's, many estates are replanting Petit Verdot vines (or, in some cases, tending to vines that they had previously abandoned) and are using a bit more of it in their blends. By 2000, total acreage in Bordeaux had reached about 400 ha. Many new world climates are much warmer and less variable than Bordeaux, so plantings of Petit Verdot have started to appear and have taken off in some regions. Australia leads the way with four times more Petit Verdot plantings than France and a fairly substantial number of varietal bottlings. That California is very high on the list (with about 900 ha planted) shouldn't be too much of a surprise given the large number of Meritage bottlings in the area and the fact that varietally labeled wines can have up to 25% of other grapes in the blend (so some Petit Verdot probably sneaks in to quite a few wines labeled simply "Cabernet Sauvignon," "Merlot," what have you). Petit Verdot is used mainly as a blending grape here, though there are a few varietal bottlings as well. When I visited Long Island, NY, wine country a few years back I was surprised to find a few varietal Petit Verdot bottlings which were much better than I expected them to be. It pops up in other states throughout the US as well, with Virginia in particular doing a lot with the grape. Spain doesn't figure in any of the statistics for Petit Verdot given by Wikipedia or The Oxford Companion to Wine, but there is apparently quite a bit of the grape planted here. According to one source, the grape may be native to southern Spain and was brought to the Bordeaux region by the Romans several thousand years ago. The grape's ripening profile certainly points to an origin outside the cooler Bordeaux region, but the lack of specific records and an unknown parentage mean that for now, the grape's true origins are shrouded in mystery. Whatever the case turns out to be, parts of Spain are nearly ideal environments for ripening Petit Verdot properly as the growing seasons here are longer and warmer than in Bordeaux, giving the grape a chance to make it all the way through the ripening process. The wine that I was able to find was the 2005 Finca Omblancos "Denuño" bottling from the Jumilla region of Spain which I picked up for a mere $10 (it is 90% Petit Verdot with 5% each of Monastrell (the local name for Mourvedre) and Syrah). Jumilla is located in the broader region called the Levante, which is the elevated, extremely dry and extremely warm area right in the middle of Spain. Summer temperatures here can reach 104 degrees Fahrenheit (40 Celsius) and the dry climate means that the growers/producers can let the grapes hang on the vine until they're ripe without worrying too much about harvest time rains. In the glass, this wine was an opaque, inky purple-black color. The nose was nicely aromatic with blackberry and blackcurrant fruits along with some smoke and bacon. On the palate the wine was full bodied with medium acidity and fairly high tannins. There were dense flavors of blackberry and blackcurrant fruit with substantial earthy flavors of smoke and charcoal. Right out of the bottle, this wine is a pure bruiser and the tannins are fierce. After being open for a little while though, the tannins settled down a bit, but this is a wine that needs food badly unless you enjoy having the insides of your cheeks stripped out by tannins. It is a big big wine for the shocking price of $10 and is tailor made for a smoky grilled steak. Poor old Molise. Italy's smallest region in total population, second smallest in total area (behind our old friend the Valle d'Aosta), and third smallest in terms of vines planted and wine produced (behind Liguria and Valle d'Aosta) gets virtually no love from anyone when it comes to their wines. Molise doesn't even warrant its own chapter in Bastianich and Lynch's Vino Italiano, with only a few scant paragraphs tacked on to the end of their chapter on Abruzzo. That link isn't wholly arbitrary, as Molise and Abruzzo were once a single administrative unit, but it is telling that Molise is the only region not to receive its own chapter in that book (aside, obviously, from Abruzzo, which it is grouped with and dominated by throughout the text). For the most part, an ignorance of the wines of Molise doesn't constitute any glaring hole in any wine lover's understanding of the world of wine. In fact, it doesn't even represent a glaring hole in an understanding of the wines of Italy. The fact is, on the larger stage, the wines of Molise have been ignored for valid reasons. Quality production here is very low, which is reflect in the fact that there are only three DOC zones in the entire area: Pentro d'Isernia near the Campagnian border in the west, Biferno near the regional capital of Campobasso in the south, and a catch-all DOC covering the entire region. The dominant grapes of Molise are Montepulciano and Trebbiano d'Abruzzo, showing the Abruzzo influence here, but there is also a fair bit of Falanghina, Greco, Fiano and Aglianico, showing the influence of Molise's neighbor to the west, Campania. There are, of course, the usual international grape suspects as well. For the most part, there aren't as many indigenous grapes in Molise as there are in other regions, but there is at least one, and that's the grape we're concerned with today. 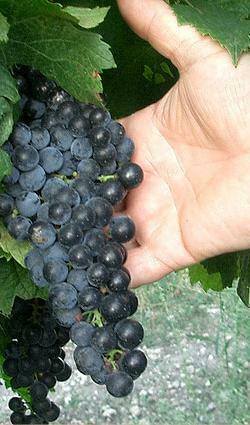 Tintilia del Molise is considered to be the most interesting indigenous grape of Molise. 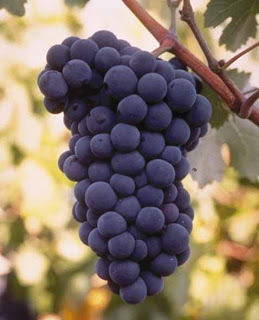 As you might guess from the name of the grape, it is thought to have Spanish origins (tinta = red in Spanish) and for many years, it was considered to be identical to one of the Bovale grapes (which may or may not be identical or related to the Bobal grape but in any case are almost certainly a Spanish import into Sardinia). DNA testing done at the University of Molise proved that the grape is unrelated to either Bovale clone (Sardo or Grande), so the grape's history is open to interpretation. Some people think that the name is enough to pin the origins to the Spanish and believe that the grape was introduced to Molise sometime in the 17th Century, but others (notably Claudio Cipressi of Cantine Cipressi, in this interview) believe that the grape's history goes all the way back to the Samnites who inhabited the region prior to Roman rule. Whatever the case is with the grape's ancient history, its more modern history is a little easier to trace. The vine was pushed to the brink of extinction as many growers uprooted their plantings. Tintilia is a notoriously low-yielding vine and in a world where growers tend to be paid for the total volume of grapes provided, Tintilia was not a very profitable option. The grape survived in a few patches here and there and was not really "re-discovered" until the late 1990's, when a few quality-conscious producers took notice of the vine and decided to try to make a go of it (fueled in part, I believe, by the creation of the area-wide Molise DOC in 1998 which allowed wines made from at least 85% Tintilia grapes to carry the DOC designation). The grape is perhaps best known for its intense pigmentation, making very dark, inky wines. But does it taste good? To find out, I picked up a bottle of the 2007 Cianfagna "Sator" bottling of Tintilia del Molise for about $40 from my friends over at The Spirited Gourmet. The grapes for this wine come from south-facing vineyards about 500 meters above sea level near the town of Acquaviva Collecroce in the northeastern part of Molise. In the glass the wine was dense and opaque nearly all the way out to the narrow crimson-ruby rim. The nose was a bit reserved with aromas of blackberry and black cherry with some boysenberry, vanilla spice and chocolate notes. The palate was full-bodied with medium acidity and medium, powdery tannins. There were rich blackberry and cherry fruits with chocolate, boysenberry and spice notes. The fruit flavors were very ripe and up front in this wine, which was not what I was expecting from a region known for its rusticity. The fruit flavors here were so ripe that I wondered several times whether this wine was actually off-dry, though it's certainly possible that the whopping 14.5% alcohol could be playing into that perception. Many producers in the area are experimenting with new oak contact for their Tintilia wines, and it wouldn't surprise me at all if this had seen some new oak (their website is a terror to try and navigate and decipher so I'm not 100% sure). It's a very new-world styled wine that should please a lot of palates, so if you're a fan of fruit-forward, oaky wines, I have a feeling you may have found a new friend in this bottle. If that lush style doesn't really do it for you, Italy has plenty of other options for you to take solace in. 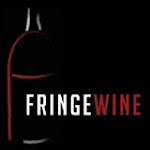 Today marks the 100th post on Fringe Wine! When I started a little over a year ago, I had only three bottles in my cellar and I wondered whether I would be able to find enough unusual grapes to warrant having a site that was dedicated exclusively to them. I now have over 100 unusual bottles in my cellar and about 20 tasting notes written up that should keep this site active for at least another 100 posts! To celebrate, I generally like to open up some bubbly wine, but I don't currently have any tasting notes written on any celebratory bubbles, so I figured I'd do the next best thing. 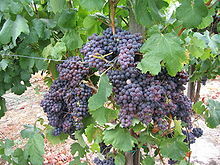 Today's grape is Pinot Meunier, which is one of the three major grapes of the Champagne region in France. What makes this wine unusual is that it is a still red wine made from Meunier grapes grown and vinified in Oregon. I visited Oregon wine country a few years ago to sample their Pinot Noir wines and left profoundly impressed. I didn't run across any Pinot Meunier while I was out there, but as we will see, it makes sense that it's grown in the same kinds of regions that Pinot Noir thrives in. You might guess just from looking at the name of the grape that it has some relation to Pinot Noir, and you'd be right. Just what the relationship is is a little more complicated, though. A study in 2000 concluded that Meunier was likely one of the parents of Pinot Noir, but more recent genetic testing has not only disproved that, but it has also found much more interesting stuff. The dummy version that you'll find most places today is that Meunier is a mutation of Pinot Noir, and that's true, but it's not the whole story. What Meunier actually is is a chimera, which in botanical terms means that the plant itself is made up of two genetically distinct kinds of tissue. In most organisms, cells taken from any part of the organism will have identical DNA. Cells taken from your nose will have the same DNA as cells taken from your heart or your blood cells. In chimeras, one part of the organism is genetically distinct from the other parts, though all the parts still co-exist within a single organism. The whole story is complicated, but essentially what's going on is this. There are different layers of cells throughout the plant and what has happened with Meunier is that one of those layers is genetically different from the others. In Meunier's case, this cell layer is responsible for the downy white appearance of its leaves which gives it its name (Meunier is derived from the French word for "miller," or baker, due to its resemblance to flour). Sometimes this mutated cellular layer gets turned off or overridden by the other layers and you end up with leaves that have sections that have the white hairs and sections that don't sometimes on the same leaf! Chimeras aren't incredibly rare in the plant kingdom, but they're not especially common either and Pinot Meunier is the only example of a chimera in the world of commercially grown grapes that I am aware of (though there certainly could be others). Franks T, Botta R, Thomas MR (2002) Chimerism in grapevines: implications for cultivar identity, ancestry and genetic improvement. Theor Appl Genet 104: 192-199. So now that we have the geekery out of the way, let's talk a little about Meunier. As mentioned above, it is best known for its role in the production of sparkling wine in Champagne. Growers there like it because it buds later and ripens earlier than Pinot Noir, meaning it has a shorter growing season and attains ripeness more often than Pinot Noir (which is kind of a mixed blessing for sparkling wine production). This ripeness, it is said, gives richness, body and weight to the final Champagne blend. For many years, producers didn't want to admit the use of any Pinot Meunier (excepting Krug who proudly acknowledged its use) though that stigma seems to be slipping away. It is thought that Meunier covers about 40% of the vineyard area in Champagne, making it the most widely grown grape there, though it is giving ground to modern plantings which emphasize Chardonnay and Pinot Noir over Meunier. 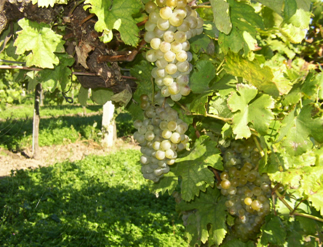 The grape is also grown in Germany where it is knowns as schwarzriesling (black riesling), Müllerrebe, and/or Müller-Traube. It covers about 2,500 hectares of land in Germany and is gaining popularity. Meunier also has a long history in Australia, where still wine production from the grape actually pre-dates Pinot Noir production. Current plantings are scant, though, at a mere 150 hectares, mostly used in sparkling wine production. 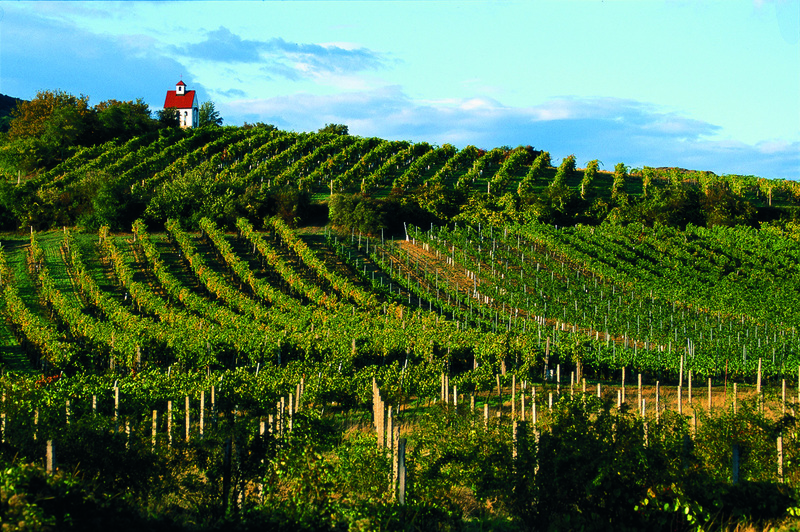 There are also some plantings in the USA, again, mostly used for sparkling wine production. I had an example from a winery on Long Island a few years back that was pretty unmemorable as well. And then there's this bottle from the Willamette Valley in Oregon. I was able to find a bottle of the 2007 Willakenzie Estate Pinot Meunier from a local shop for about $27. In the glass, the wine was a medium crimson ruby color. The nose was fairly aromatic with juicy strawberry, tea leaf, raspberry and forest floor characteristics. On the palate, the wine was medium bodied with acidity on the higher side of medium and low tannins. There were flavors of strawberry and raspberry fruit along with black tea, baking spice and a touch red cherry. The alcohol seemed a little hot and slightly out of balance, but overall, it was a very nice wine. The overall impression from this wine is very similar to Pinot Noir and I would have liked to taste this side by side with a Pinot Noir from the same vintage and producer to see what the differences really are. If I had this served to me at a blind tasting, I would peg it as Pinot Noir every single time and probably wouldn't hesitate about it. If you are a fan of Pinot Noir, you should definitely give Meunier a shot, if you can track a bottle down. Last week, we took a look at a little known grape from the Valle d'Aosta called Cornalin. Today I'd like to look at yet another unusual grape from this region, Prëmetta. 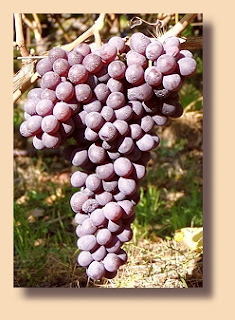 Unlike Cornalin, there is very little information available about the Prëmetta grape. Belfrage makes little mention of it in his book Barolo to Valpolicella, Wikipedia (the English version) has no entry on it (there is an entry in the German Wikipedia, though not in the Italian one), it is only mentioned in passing in The Oxford Companion to Wine, and it is mentioned only in its connection to rosé wine production in Bastianich and Lynch's Vino Italiano. As mentioned in my post on Petit Rouge, another native red grape from the Valle d'Aosta, 90% of production in this cool, Alpine region, surprisingly, is red wine. 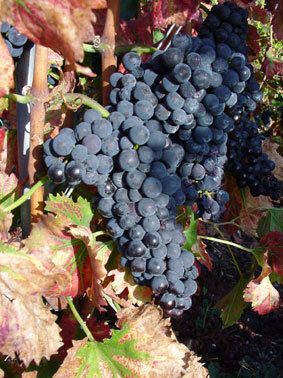 Prëmetta could be considered a borderline case, as the wines that are made from this grape tend to resemble rosé wines more so than red wines. In fact, the grape is called rosato naturale in its native land because of the light wines made from it. If you look closely at the picture of the grape cluster above, you can get a sense for why these wines may come out this way. The skins aren't very dark, first of all, which means that there isn't much pigmentation available to color the wines. Further, the skins themselves are very thin so not only is there not much pigmentation in the skins, but there isn't that much skin available for the pigmentation to leech from. In addition to the thin, lightly colored skins, the grapes themselves tend to be large and very juicy, meaning the skin to juice ratio is very low. Add all of these together and the result is generally a pale colored wine that is nevertheless strongly strawberryish on the nose and palate. The grape is sometimes called Prie Rouge (actually, the VIVC indicates that Prie Rouge is in fact the correct cultivar name and Prëmetta is merely a synonym) in the Valle d'Aosta and those who are well-versed in other grapes of the region may recognize part of that name. 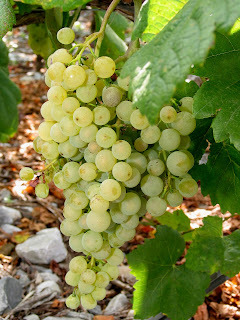 One of the better known white grapes from the Valle d'Aosta is called Blanc de Morgex, or Prie Blanc. The two grapes are related, but then again, nearly all the grapes in the Valle d'Aosta (as well as some of the grapes just over the border in Switzlerand) are related to one another somehow. There's a really cool article in the journal Vitis that shows how the various grapes in the Valle d'Aosta relate to one another that you can check out here if you're so inclined. Science is fun, but we're really here to talk about the wine. I was able to find a bottle of the 2006 Prëmetta from the Institut Agricole Regional at Curtis Liquors for about $20. In the glass, the wine was a pale, brickish ruby color. The nose was reserved with some plummy, floral scents. On the palate, the wine was on the lighter side of medium with high acid and a touch of stringy tannin. There were tart cherry and wild strawberry fruits with a bit of wild raspberry as well. The wine had a steely, metallic edge to it that really stuck around on the finish. This is a grape that is best drunk young, so it's definitely possible that my bottle was slightly past its prime, but it paired fairly well with a bacon-wrapped pork tenderloin. I generally find these lighter, high acid, berryish red wines to be much more food friendly than heavier, more extracted wines which only seem to work with thick meat stews or heavily charred meats. If you're a fan of lighter reds like Schiava then Premetta is definitely worth a shot. If you're only into hulking blockbusters, then give this wine a wide berth. Cornalin is a more complicated grape that you might think at first. If you just stick to the books on Italian wine, you might be led to believe that Cornalin is downright uninteresting, as there is hardly a mention of the grape in any of the Italian wine books that I have. I was prepared to do a lot of digging for a little information and then try to stretch that into a whole blog post, but the real world has alternate plans for me today it would seem. To start with, there are two different grapes called Cornalin. In Switzerland, there's a grape called Rouge de Pays which is also known as Cornalin du Valais. This grape is actually an offspring of Petite Rouge and Mayolet, two red grapes thought to be native to the Valle d'Aosta region of Italy. It is grown in the Valais region of Switzerland (where they have about 116 hectares under vine) and is one of the better regarded red grapes within Switzerland. And then there's Cornalin d'Aoste, which is an offspring of Cornalin du Valais. Cornalin d'Aoste is also known as Humagne Rouge and is also grown in the Valais region of Switzerland, where they have about 128 hectares under vine. It becomes a little clearer at this point to see why my Italian wine books breeze right over any mention of either Cornalin, as they seem to be specialties of Switzerland at this point, though there is obviously some connection to the Valle d'Aosta region of Italy in the genetic lineage as well as the naming of one of the grapes. Switzerland does, of course, share a border with the Valle d'Aosta so the movement of grapes between the two areas isn't a particularly mysterious or rare phenomenon. The problem that I now have is that it isn't clear at all which Cornalin I actually tasted. My bottle came from the Institut Agricole Regional in the Valle d'Aosta and is labeled merely "Cornalin" with no additional information on the back label. Both varieties have "Cornalin" as an acceptable synonym, so that's no real help. I was able to track down the paper discussing the genetic work done on the two cultivars where it becomes clearer that Rouge de Pays (Cornalin du Valais) was not called Cornalin until 1972 and that the name was specifically borrowed from the grape called Cornalin within the Valle d'Aosta. The Italian grape was first referred to as Cornalin in 1837, giving it historical precedence. So the grape grown in the Valle d'Aosta is Cornalin d'Aoste, also known as Humagne Rouge in Switzerland. Furthermore, the paper informs me that the Intitut Agricole Regional is the keeper of the "standard" version of Cornalin, meaning they possess the vines that are used in all of the genetic research as being the "true" or "original" Cornalin vine. For those interested in reading more about it, the article is in the August 2003 issue of Theoretical and Applied Genetics, pages 448-454 (the authors of the paper are J. Vouillamoz, D. Maigre, and C.P. Meredith and the paper is caled "Microsatellite analysis of ancient alpine grape cultivars: pedigree reconstruction of Vitis vinifera L. "Cornalin du Valais"). Ok, so on to the wine. As mentioned above, I was able to find a bottle of the 2007 Cornalin from the Institut Agricole Regional at Curtis Liquors for about $18. In the glass, the wine was a lightish purple ruby color. The nose was medium intensity with aromas of wild strawberry and strawberry jam with some raspberry and red cherry notes. On the palate, the wine was on the fuller side of medium with fairly high acidity and low tannins. There were flavors of red cherry and bitter cherry pit along with some plummy red fruit. The wine had a definite bitter herbal or medicinal edge to it that tasted like anise or black licorice. Pinot Noir is the most obvious comparison here with a lot of red fruits on the nose and palate, but it was a little fuller and had that serious bitter edge to it. If you think about trying to drink Trousseau through a black licorice straw, you probably wouldn't be too far off. The wine was slightly improved on day two of tasting after being open all night, but it wasn't a significant change. The bitterness was a little too much for me and prevented me from being able to fully enjoy this, but it was definitely cool and interesting and is something I'd give another shot if another ever crosses my path. Reader Kate has translated this post into Polish. Those interested in checking out her translation can do so here. There are some grapes that are grown in such limited quantities that its a wonder that one ever runs across them at all. When I'm reading about wine and I come across some of these super-obscure grapes, I can do little more than cross my fingers and hope that some insane importer is distributing something from that grape in my neck of the woods, but for the most part I have to make a mental note and hope that maybe one day I can visit some of these regions and bump into these grapes in their natural habitat. Today's grape is one of those crazy-obscure grapes that I never expected to bump into. To be totally fair, I actually had never heard of it until I saw it in the shop, but once I picked it up and did a little research, I realized what an unusual find I had made. The grape is Amigne and it is a minor specialty of a very small region of Switzerland called Vétroz, which is located within the Valais in the southwestern part of Switzerland. I have four different sources and all four have different figures for total acreage devoted to the vine. The Oxford Companion to Wine is the most conservative giving a figure of 25 hectares under vine, while the first bottle that I was able to try indicates that there are 33 hectares under cultivation. The Amigne producers website says there are a total of 38 hectares across all of Switzerland (with 27 of them in Vétroz) while Wikipedia indicates there are 43 acres under vine as of 2009. Whatever the actual number is, it is very small. To compound matters, Switzerland exports very little of its production (less than 2%) so finding a wine made from this grape is a serious challenge. Be that as it may, two (yes, two) bottles did end up in my cellar, so I'm here to tell you a little about Amigne. It's a very old grape, thought to have been brought to Switzerland by the Romans. A writer named Columella (AD 4 – ca. AD 70) mentions a grape called vitis aminea in his De Re Rustica which is purported to be the very same Amigne grape grown today. However, the first specific mention of Amigne in print doesn't come until 1878. It was long thought to be related to Petite Arvine, but DNA studies have recently shown that it has a parent/offspring relationship with a grape called Petit Meslier, a nearly extinct grape grown in limited quantities in Champagne (there are about 20 hectares under vine there). This relationship also apparently means it is somehow related to Gouais Blanc and our old friend Savagnin, though I don't understand the family tree enough to completely sort out how they link together. The first Amigne based wine that I tried was a 2003 Jean-Rene Germanier Amigne de Vétroz that I picked up from my friends at Curtis Liquors for about $35. The wine was a golden color in the glass with a fairly shy nose. There were aromas of orange and honey with some marmalade, spice and floral notes to it. On the palate the wine was on the fuller side of medium though just shy of being full-bodied with fairly low acidity. It was sweet, which warrants a brief digression. Amigne is made in many styles from bone dry to extraordinarily sweet. Until 2005, you had no way of knowing which style was in the bottle you picked up just by looking at the label. As of 2005, though, the winemakers of Vétroz all got together and introduced the abeilles scale to indicate the sweetness level of the wine. The scale consists of a rating from one to three bees with each bee representing a step up on the sweetness ladder. One bee (dry) means the wine has between zero and eight grams per liter of sugar; two bees (half-dry) indicates 9-25 g/l and three bees (sweet) means there is more than 25 g/l. Since this bottle was made in 2003, it did not have the abeilles scale on the bottle, but I'd guess it would fall on the higher end of the two-bee rating, if you made me guess. The lowish acidity of the grape exaggerates the sensation of sweetness, so while it tasted pretty sweet to me, I would hazard the opinion that it still was technically half-dry rather than fully sweet. In any case, there were flavors of mandarin orange and tangerine with honeysuckle flowers, orange marmalade, apricot jam and baking spice. Oz Clarke, in his Grapes and Wines notes that Amige can sometimes have a bit of a brown bread character to it, and that definitely came through a bit on the finish. The wine is tasty and well-made, but the low acidity was a problem for me. It came off syrupy and cloying without the acid balance and was tough to drink for more than a glass at a time. It actually reminded me quite a bit of some of the off-dry whites from Georgia that I tasted a few months back, though it was a bit more complex and focused than those wines (and also double to triple the price). When I bought the wine above, I wasn't sure about the aging potential of Amigne, so I wasn't sure if the wine was perhaps past its prime. To hedge my bet, when I saw a bottle of the 2006 "Les Ruinettes" from Serge Roh at the Spirited Gourmet, I went ahead and picked the bottle up for about $34. As it turns out, I didn't have anything to worry about as Amigne's drinking window is really open for 5-10 years beyond the vintage date. In the glass, this wine was a light gold color with a fairly strong greenish tinge to it. The nose was shy with some aromas of grapefruit peel and orange with a little honeysuckle flower, but overall there wasn't much going on. On the palate, the wine was on the fuller side of medium with low acidity and was medium sweet. It's hard to see from the picture, but this wine had an abeilles rating of two bees (you can see three bees, but only two of them are fully darkened, which is how the scale is measured). There were flavors of mandarin orange, sweet grapefruit, and honeysuckle flowers with the same kind of brown-bread finish to it. This wine was less obviously sweet than the other, and was higher in alcohol. The Germanier bottle was 13.5% while this was 14.5%, indicating perhaps that more of the sugar was converted during fermentation, making this a little less sweet. The overall taste sensation was the same, though, with a serious lack of acidity that I personally couldn't get over. There probably are wine drinkers out there who will be a fan of this syrupy style, but personally, I'd rather invest in an auslese or spätlese level Riesling.